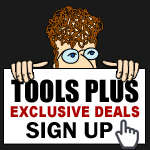 Tools-Plus.com carries an extensive array of Abrasive and Buffing products. These items can sand, polish, cut and smooth just about any surface imagineable. Whether you're looking for sandpaper, wire brushes or even the old reliable file; Tools-Plus.com has you covered start to finish.